Mistakes in revenue records allegedly introduced by officials at the time of registration, updating and transfer of properties or agricultural land are proving costly for the owners. They are being forced to shell out money in the name of ‘fardbadars’ (correction of mistakes) in revenue records. 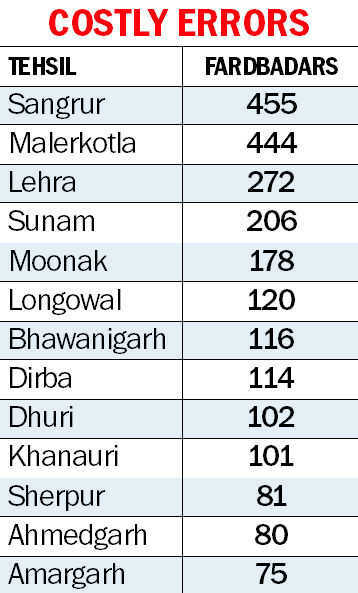 At least 2,344 ‘fardbadars’ were recorded in Sangrur district alone last year. Avikesh Gupta, SDM, Sangrur, has ordered an inquiry into 455 ‘fardbadars’. “I will probe the reason behind the high number,” he said. During 2018, in all 13 tehsil offices, a total of 2,344 ‘fardbadars’ took place. Sangrur is on the top with 455 cases. Fearing harassment by officials, property owners, including many farmers, are unwilling to lodge a complaint or even talk about it. Some, on condition of anonymity, demanded an inquiry against officials who “deliberately introduce errors and demand money to make corrections”. “Till 2008, the name of my father was spelled correctly in the records as Mahinder Singh. In 2013, during the division of property, the name was changed. I had to face a lot harassment to get the mistake rectified. There are hundreds of others facing similar problem,” said a Sangrur-based farmer. “Revenue Department officers are deliberately committing errors so as to mint money in the name of updating records. But property owners are not willing to come on record. We have demanded a high-level inquiry,” said Jarnail Singh Jahangir, district press secretary, BKU Lakhowal. Sangrur Deputy Commissioner Ghanshyam Thori said he had not received any complaint in this connection. “I will look into the matter and if any officer is found harassing people, strict action will be taken,” he said. Your Next Fitness Coach Is… Your Boss?